Basel, June 4, 2016 - Novartis today announced at the 52nd American Society of Clinical Oncology (ASCO) Annual Meeting, the first results from the Tasigna (nilotinib) Treatment-free Remission (TFR) clinical trial program. These studies evaluated the potential to maintain molecular response (MR) after stopping therapy in adult patients with Philadelphia chromosome-positive (Ph+) chronic myeloid leukemia (CML) in the chronic phase who achieved a sustained deep level of molecular response with Tasigna - a concept called TFR. Findings from two open label trials, ENESTfreedom and ENESTop, showed that more than 50% of Ph+ CML patients who met the rigorous predefined response criteria of the trials were able to maintain TFR after stopping Tasigna both in the first-line setting and after switching from Glivec (imatinib)*,. Discussions with regulatory authorities are underway with potential submissions in 2016. Results from the ENESTfreedom study found that more than half (51.6%) of 190 CML patients (confidence interval [CI] 95%: 44.2%-58.9%) who achieved a sustained deep molecular response following at least three years of first-line treatment with Tasigna were able to discontinue therapy and remain in TFR for 48 weeks. ENESTfreedom did not meet its primary objective, the percentage of patients in major molecular response (MMR; BCR-ABL1 International Scale [IS] <= 0.1%) at 48 weeks in the TFR phase, per the original statistical assumption that the lower limit of the 95% CI will be equal to or greater than 50%. The median treatment duration in this trial was 3.6 years which is a short length of tyrosine kinase inhibitor (TKI) exposure prior to attempting TFR. Of the 86 patients who restarted treatment with Tasigna due to loss of MMR, 98.8% were able to regain MMR (n=85) and 88.4% were able to regain MR4.5 (BCR-ABL1 IS <= 0.0032%; n=76) . By weeks 7.9 and 15.0 of treatment reinitiation with Tasigna, 50% of retreated patients already achieved MMR and MR4.5, respectively1. One patient discontinued the study at 7.1 weeks without regaining MMR after reinitiating treatment with Tasigna. "ENESTfreedom is the first trial to show that, after a short treatment duration with nilotinib of 3.6 years, more than 50 percent of patients who stopped therapy were able to remain treatment-free at 48 weeks," said Dr. Andreas Hochhaus, Head of the Department of Hematology and Medical Oncology, Jena University Hospital, Germany, and primary investigator for the ENESTfreedom study. "Findings from the nilotinib TFR trials add to the existing body of research exploring the discontinuation of tyrosine kinase inhibitor treatment in CML and may help to establish safe and appropriate criteria for eligible patients to stop treatment,,." ENESTop, the second Novartis TFR trial at ASCO, evaluated 126 patients who were able to achieve a sustained deep molecular response with Tasigna, but not with prior Glivec therapy. In this trial, nearly 6 out of 10 (57.9%) patients (95% CI: 48.8%-66.7%) who achieved a sustained deep molecular response following at least three years of Tasigna therapy maintained a molecular response 48 weeks after stopping treatment. The study met its primary endpoint of the proportion of patients without confirmed loss of MR4.0 (BCR-ABL1 IS <= 0.01%) or loss of MMR within 48 weeks of Tasigna discontinuation in the TFR phase. In the study, 51 patients with confirmed loss of MR4.0 or loss of MMR restarted Tasigna. Of these patients, 98.0% (n=50) regained at least MMR, with 94.1% (n=48) and 92.2% (n=47) regaining MR4.0 and MR4.5, respectively. By weeks 12.0 and 13.1 of treatment reinitiation with Tasigna, 50% of retreated patients already achieved MR4.0 and MR4.5, respectively. One patient entered the treatment reinitiation phase but did not regain MMR by 20 weeks and discontinued the study. The BCR-ABL1 for this patient was 62.2% at the start of Tasigna retreatment and 9.8% at study exit. "Novartis has been at the forefront of advancements in the treatment and understanding of CML for 20 years," said Alessandro Riva, MD, Global Head, Novartis Oncology Development and Medical Affairs. "The exploration of TFR in patients treated with Tasigna, which includes Novartis support of eight TFR studies, is the next step in our commitment to advancing care for patients living with this disease." Results from ENESTfreedom were presented today in an oral session (Abstract #7001, 3:12 p.m. CDT) at ASCO in Chicago. Data from ENESTop will be presented in a poster session on June 6 (Abstract #7054, 8:00-11:00 a.m. CDT). Both studies are ongoing, with planned follow-up to evaluate the ability of patients to sustain remission for longer durations following discontinuation of Tasigna. 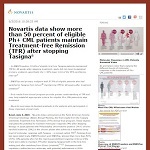 These are the first presentations of data from the Novartis Tasigna TFR clinical trial program. An important part of the Tasigna TFR studies is regular and frequent molecular monitoring with a well-validated assay able to measure BCR-ABL transcript levels down to MR4.5. Frequent patient monitoring during TFR allows timely determination of loss of MR4.0 and MMR and need for treatment initiation,. No new major safety findings were observed in these studies in patients treated with Tasigna beyond those in the known safety profile of Tasigna,. In ENESTfreedom, 24.7% of patients experienced musculoskeletal pain during the first year of the TFR phase versus 16.3% while still taking Tasigna in the one-year consolidation phase. In ENESTop, the rates of all grade musculoskeletal pain were 42.1% in the first year of the TFR phase versus 14.3% while still taking Tasigna in the consolidation phase. No patients progressed to advance phase/blast crisis in the two studies,. Stopping CML treatment is currently not a clinical recommendation and should only be attempted in the context of a clinical study. Discontinuation of treatment in ENESTfreedom and ENESTop was conducted under the conditions of the trials and in patients who met the rigorous predefined criteria of the trials,. Novartis is supporting eight studies as part of its TFR clinical trial program, which includes ENESTfreedom and ENESTop, as well as two other ongoing company-sponsored TFR studies and four investigator-initiated studies that are now underway in more than 100 global sites across 40 countries. Over the past several decades, Novartis research in Ph+ CML has helped transform the disease from a fatal leukemia to a chronic condition and, today, the company continues its long-standing commitment to the global CML community. Novartis follows the science and builds upon existing evidence to explore what could be the next major contribution in the treatment of Ph+ CML through these TFR trials as well as investigational compounds. ENESTfreedom (Evaluating Nilotinib Efficacy and Safety in Clinical Trials - Following REsponsE in De nOvo CML-CP Patients) is an open label Phase II study involving 215 Ph+ CML patients in the chronic phase, conducted at 132 sites across 19 countries. ENESTfreedom evaluated stopping treatment in 190 adults with Ph+ CML after the patients had achieved a response of MR4.5 with Tasigna and a sustained deep molecular response for one year as a first-line treatment. ENESTop (Evaluating Nilotinib Efficacy and Safety Trial) is an open label Phase II study involving 163 Ph+ CML patients, conducted at 63 sites across 18 countries. The trial evaluated stopping treatment in 126 adults with Ph+ CML in the chronic phase after patients had achieved and sustained deep molecular response for one year with Tasigna following Glivec. The foregoing release contains forward-looking statements that can be identified by words such as "potential," "underway," "exploring," "may," "exploration," "next step," "commitment," "continues," "explore," "could," "investigational," or similar terms, or by express or implied discussions regarding potential new indications or labeling for Tasigna or Glivec, regarding potential marketing approvals for Novartis investigational compounds, or regarding potential future revenues from Tasigna, Glivec or such investigational compounds. You should not place undue reliance on these statements. Such forward-looking statements are based on the current beliefs and expectations of management regarding future events, and are subject to significant known and unknown risks and uncertainties. Should one or more of these risks or uncertainties materialize, or should underlying assumptions prove incorrect, actual results may vary materially from those set forth in the forward-looking statements. There can be no guarantee that Tasigna or Glivec will be submitted or approved for any additional indications or labeling in any market, or at any particular time. Neither can there be any guarantee that any Novartis investigational compounds will be submitted or approved for sale in any market, or at any particular time. Nor can there be any guarantee that Tasigna, Glivec or any Novartis investigational compounds will be commercially successful in the future. In particular, management's expectations regarding Tasigna, Glivec and such investigational compounds could be affected by, among other things, the uncertainties inherent in research and development, including unexpected clinical trial results and additional analysis of existing clinical data; unexpected regulatory actions or delays or government regulation generally; the company's ability to obtain or maintain proprietary intellectual property protection; general economic and industry conditions; global trends toward health care cost containment, including ongoing pricing pressures; unexpected manufacturing issues, and other risks and factors referred to in Novartis AG's current Form 20-F on file with the US Securities and Exchange Commission. Novartis is providing the information in this press release as of this date and does not undertake any obligation to update any forward-looking statements contained in this press release as a result of new information, future events or otherwise. Hochhaus, A. et al. Treatment-free remission (TFR) in patients (pts) with chronic myeloid leukemia in chronic phase (CML-CP) treated with frontline nilotinib: Results from the ENESTfreedom study. Oral Presentation. Abstract #7001. 2016 American Society of Clinical Oncology (ASCO) Annual Meeting in Chicago, IL, USA. Hughes, H.P. et al. Treatment-free remission (TFR) in patients (pts) with chronic myeloid leukemia in chronic phase (CML-CP) treated with second-line nilotinib (NIL): First results from the ENESTop study. Poster Presentation. Abstract #7054. 2016 American Society of Clinical Oncology (ASCO) Annual Meeting in Chicago, IL, USA. Hughes, H.P. and Ross, R.M. Moving treatment-free remission into mainstream clinical practice in CML. Blood. 2016. Advance online publication. doi# 10.1182/blood-2016-01-694265.